Glue the toys or other decorations to the inside of the lid, making sure the lid can still fit on the jar. Fill the jar halfway with glycerin, then fill it almost to the top with water, then stir to mix. Add a small amount of glitter. Stir with a spoon to test the ‘snow’ effect, and add more until you get the flurries or blizzard you like. Fill the jar up the rest of the way, until the water is just above the top of the jar. Gently put the lid on and screw it securely to the jar. Wipe any water off the jar, and put some hot glue or tape around the lid. Glycerin has a very high viscosity. Viscosity is how ‘thick’ a liquid is, how easily it pours. Honey and syrup have pretty high viscosities, water and rubbing alcohol have very low viscosities. 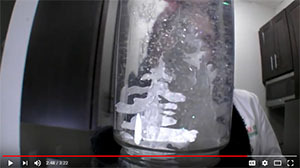 Having a mixture of water and glycerin means the liquid inside your snow globe slows the glitter down as gravity pulls it down. This helps it look more like snow.